Developing natural products and new value chains in Kelantan while maintaining cultural integrity: What, How and For Whom. Kelantan, situated in the Far North-East of the Malay Peninsula has been built upon the proud traditions of a rural based social-economy. The Malaysian state of Kelantan has been relatively independent, without direct foreign occupation and control since the early 1400s, except for short periods by the Siamese and Japanese. Malay tradition and culture is relatively undiluted in Kelantan in contrast with the other states in Malaysia. Maintaining cultural integrity and traditions is something important to both the social and spiritual identities and aspirations of the Kelantanese, and this factor must be considered in any potential development in the state. Therefore the development of natural products in Kelantan must be approached differently from the rest of Malaysia due to the above cultural factors and aspirations of local people. Ignoring international opportunities for natural based products would disadvantage Kelantan, but at the same time ushering in large multinational companies to exploit Kelantan’s natural resources such as land would have high social costs from the Kelantanese perspective. This implies that the development of natural products should be on a small enterprise scale rather than large enterprise scale, the new industries do not drastically change cultural conditions, and this be achieved with limited resources and more upon local exploration and cooperation, rather than outside interference. Consequently business models based on cooperative labour and shura decision systems, in decentralized production units would be a preferred option. Marketing paradigms need to be developed that carry Kelantanese culture as a theme specializing in particular niche markets need to accompany these new production models. The potential for natural product development in Kelantan along the business models outlined above include herbs, essential oils, nutraceuticals, cosmoceuticals, natural dyes, Islamic medicines, food ingredients, traditional products, and some biotechnology based products including organic agricultural chemicals, all with Toyyib/Halal integrity can be developed and commercialized with specialized value chains based on low resource endowments. These products have specific markets nationally, regionally, and internationally through new supply chains developing across the world including organic, Fair-trade, and Halal markets. This paper will discuss the above issues, canvass what products can be developed, how they can be developed and new value chains created, with a low resource endowment on the part of local entrepreneurs. E.F. Schumacher 1975, P. 168. Kelantan is situated in the far North-East of the Malay Peninsula, bordering the Southern Thai province of Narathiwat in the North, Perak in the West, Taman Negara in the South, and Terengganu along the East Cost. The majority of Kelantan’s 1.45 million inhabitants reside on a fertile coastal flood plain where paddy, rubber, and fruit crops are produced. There is a long established fishing industry situated where the Kelantan River meets the South China Sea. Kelantan is accessible by road along the coast, from the Western part of the Peninsula through Grik and Jeli, and now to Kuala Lumpur through Gua Musang via Pahang. 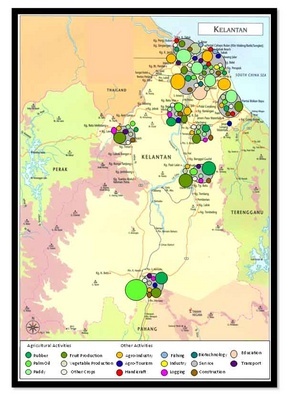 The Titiwangsa Mountains running North-South along the Western border of Kelantan has historically isolated the state from the rest of the Peninsula, where Southern Thailand influence has been much stronger in many regards. The Malay language is unique in Kelantan with Jawi still being used throughout the state in preference to Rumi. Malay traditions and pastimes like kite flying, bird competitions, top spinning, kertok (drumming), and even wayang kulit are still embedded within Kelantanese life. As a consequence Kelantan does not necessarily bare the full brunt of economic downturns and recessions in the same way that other parts of Malaysia does. It is apparent that Kelantanese prefer a village based life, where 65% of the population is rurally domiciled, compared to those living in other states. The gap between urban and rural dwellers is economically wide, but Kelantanese see the benefits of living in rural areas, notwithstanding that there are some disadvantages in education and exposure to opportunity. In rural areas, school dropout rates are higher, the propensity to attend higher institutes of education lower, resources scarcer, potential markets smaller, networks weaker, and exposure to the outside world where new ideas come from much less. The potential of business growth is much more limited. In addition, families tend to be more preoccupied with making a living today rather than seeing the wisdom of sending their children for higher education. Businesses tend to be more simplistic and service orientated, focusing in providing a ‘day to day’ survival rather than SMEs with high growth objectives. In addition to the above orientations and issues, technology has been very difficult to obtain because of cost, remoteness, lack of knowledge of opportunities, and lack of educational infrastructure. However with the advent of University Malaysia Kelantan (UMK) this scenario may slowly change as the university develops effective local outreach where locally orientated research results and technology is disseminated to the community. This may assist in the local communities accessing basic skills and technologies which widen the scope of entrepreneurial opportunity. Many Government agencies and programs aimed at eradicating poverty in the region have lacked market orientation. Any individual success would appear to be more the result from a few committed and passionate ‘local champions’ who have been able to develop the imagination and commitment of the people they are working with. Many different models have been utilized and new initiatives launched which often seem to lack thought and sensitivity to the target groups they are aimed at empowering. The economy of Kelantan is primarily rural based with paddy, rubber, and palm oil taking up the greatest acreage. Fruit and market gardening are also undertaken around populated areas where there are local markets. There is a logging industry based on rubber-wood, although in some areas logging is undertaken directly from the jungle. Light scale SME based agro-industry exists primarily based around the coastal areas near Kota Bharu, along with a light scale industrial base primarily catering for local engineering needs. An established fishing industry operates along the coast with spasmodic agro and eco-tourism throughout the state. Cottage handicraft industry producing kain batik, silver, and wooden products also exist on the fringes of the urban areas, these activities not penetrating into the deep rural areas as these enterprises still need a significant amount of capital. The local construction industry supplies local stock needs for residential and light commercial premises. A product space map showing the density and relative size of these industries is shown in Figure 1. Natural product based activity development is still limited in Kelantan. There are a couple of green biotechnology pilot projects underway, initiated by the Kelantan Biotechnology Corporation, and a small number of domestic herb companies have initiated contract growing and the local processing of herbs within the state. Crops produced under contract arrangements include Tongkat Ali (Eurycoma longfolia), Misai Kuching (Orthosiphon stamineus), Mas Cotek (Ficus deltoidea), Pegaga (Centella asiatica), and Dukung anak (Phyllanthus amarus). SME based herb companies are restricted due to the lack of GMP facilities available for contract processing within the state. Some minor production of essential oils and natural cosmetics is also undertaken within the state. Given the above, it is necessary to seek new areas that can provide better returns than the present activities, where the focus must rely less on traditional crops and more on new crops that can provide adequate returns. These new crops must be able to be produced without relying on high capital concepts of production and economies of scale, thus not disrupting present culture and lifestyle. This requires building new supply and value chains and changing the present paradigm from competition amongst local SMEs to that of creating cooperative and complementary businesses that can enter new markets. This will require a lot of guidance on how to discover, evaluate, develop, and grow a new SME within remote locations that connect with national and international markets. This could initially be developed as a secondary activity at a farm and village level, where it is important to consider and understand the resources and skill needs, attitudes, and aspirations when engaging with communities. Selected activities can be clustered in certain areas where all resources, skills, and connections can be made easily accessible to members of the community. These are the critical factors behind the success of the batik industry in Kelantan (Ma’rof & Fariborz 2010). Given agriculture’s limited capacity to absorb labour, other rural business activities have a paramount importance in playing a role in supplementing incomes (Shand 1983). Government and the institutional sector through the Eastern Corridor Economic Region (ECER) need to provide the infrastructure such as adequate roads, cold stores, extraction facilities, and other infrastructure that is outside the capacity of local entrepreneurs to purchase and develop on their own. The smallholder sector generally has a very low technology base. There has also been a large failure in successfully implementing new crops and developing village based products in the sector. Research institutions like MARDI follow only national new crop agendas, so regional new crop development is left to the various state agriculture departments, most having extremely limited resources for research, development and extension. 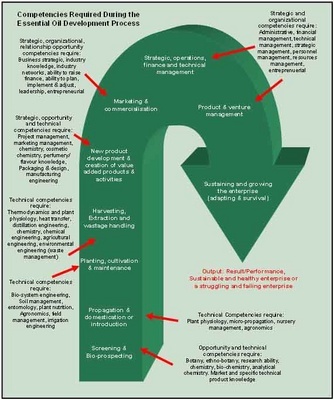 There are a number of steps required to successfully implement a new crop, which needs technical, management, entrepreneurship skills and finance. Financial institutions are extremely reluctant to advance funding for new crops and technology development. Smallholders have traditionally only been interested in cultivating crops for other people to market and sell, thus missing more profitable parts of the value chain. The author believes that failure to solve the many issues and exploit opportunities mentioned above, have a basis in a socio-psycho ‘mindset’ prevailing in the country. This is not to say that a change in mindset is the only factor that would result in solving problems and exploiting opportunities. Infrastructure, education, skills development, market scanning, new crop product and processing development and last but not least, financial support are all factors, just as important to make change. However without mindset change, the allocation of resources into all the other areas is not likely to change the nature of the rural sector. Herbs, plant extracts, enzymes, and essential oils are all natural products that require agriculture production, processing, and a serious marketing effort. All these classes of products can be cultivated in Kelantan and have rapidly growing applications and international markets. 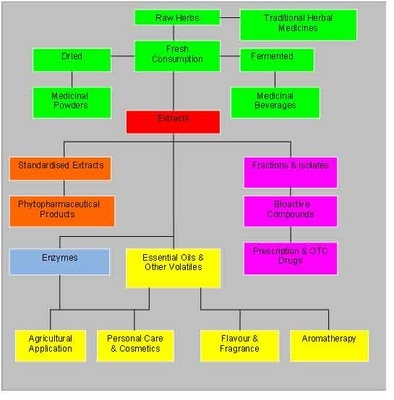 Although herbs, plant extracts, enzymes and essential oils are diverse products, they share common plant based feed-stocks, however uses and markets are diverse as shown in Figure 2., The family tree of herb derivatives. Together herbs, plant extracts, enzymes, and essential oils make up a group of potential opportunities for agro-entrepreneurs. Figure 2. The family tree of herb derivatives (Hunter 2011). Most of the product categories shown in figure 2 are in high growth mode both in the domestic and international market. Table 1 provides a brief summary of each market. What is necessary at this point is to identify specific segments in potential markets that value chains can be created to satisfy from the Kelantan perspective. This may mean focusing on specific niche markets rather than mainstream high volume markets where local SMEs would come up direct against more efficient producers from neighbouring countries like Indonesia, Vietnam, India, and China. This implies a feasibility relationship between product, channel, agronomic and technology suitability, to determine viability. Traditional systems of therapy including Homeopathy, Natropathy, Ayurveda, Sidha, Unani, and Traditional Chinese Medicine are rapidly growing in popularity throughout the world. Every long established civilization has its own form of traditional herbal medicine. This is no different here in Malaysia, where Traditional Malay Medicine (TMM) developed from the village on what flora was available, relying on knowledge being passed down from generation to generation for Hundreds of years. The largest market channel for traditional Malay herbs is now through local and foreign owned direct marketing companies. There are currently over 140 companies in Malaysia undertaking direct marketing and selling different branded versions of Malay herbs. Herbs are available as teas, tablets, capsules, balms and lotions, in cosmetics, shampoos and blended as coffees. Herbs can through various means be developed into concentrated and standardized plant extracts. These can produce a variety of products. Today, the United States is still the largest supplier of supplements to Malaysia and the majority of these products are marketed through direct selling companies, pharmacies, supermarkets and Chinese Medical Halls. The most popular items are vitamins, minerals and plant extracts. Demand for health supplements is increasing dramatically, possibly linked to the growing affluence in the country and awareness of natural products. More Malaysians are taking supplements to ward off illness and maintain a good state of health. This has also resulted in many pharmaceutical companies including dietary supplements in their product ranges. Plant extracts also have numerous applications in agriculture, particularly with the rapid growth of the organic market for fruit, vegetables, meats, and other manufactured products like textiles and cosmetics. For example, neem (Azadirachta indica A. Juss) is considered by many to be one of the wonder trees in our global bio-diversity. Numerous uses for this tree have been both reported and practiced by many indigenous peoples over the centuries. Neem is a major input in Thai and Indian agriculture for the production of natural insecticides at farm level. Neem contains a number of compounds of which two ‘steroid like’ molecules, azadirachtin and salanin, which exhibit very potent insect repellency attributes. Neem does not knock down insects like conventional pesticides, but rather interferes with the lifecycles, confusing them to the point they cannot reproduce and thus disappear (Board of Science & technology 1992). Another important group of plant extracts are Pyrethrum based products which are rapidly growing in demand for application as a pesticide in agriculture. Under most jurisdictions it is organically certifiable. Pyrethrum is extracted via solvents (usually hexane) from the flowers of Chrysanthemum cinerariifolium, which could grow well in many highland areas of Malaysia. Natural pyrethrum used to be the major active ingredient in household insecticides before the synthetic pyrethroids, which have much longer residual effects were developed. Natural Pyrethrums are non-toxic to humans and is known as one of the safest pesticides in use. Plant extracts play an extremely important role in modern personal care and cosmetic products, from shampoo, conditioner, body wash, body lotion, and face tonics, etc. A wide range of plant extracts are used, including aloe vera, galangal, angelica, celery, green tea, hawthorn, yam, ju hua, Echinacea, gingko, witch hazel, St. John’s wort, alpine lovage, tea tree, lemon balm, mulberry, lotus, ginseng, and sage, etc., of which many can be grown and cultivated in Kelantan. Enzymes are proteins that are able to catalyse chemical reactions and are an important chemical compound that supports the biological functions of all living species. Enzymes help plants, animals and humans convert substances into different molecules. The market for naturally produced industrial enzymes is in excess of USD $1.0 Billion per annum. The use of enzymes in biotechnology is expected to increase enormously in the next few years. The diversity in traditional biotech products will add more colour to the global cosmetic market. People have used them for hundreds of years and known that they work, but they haven't known how they worked. A lot of the supplier companies are investing in doing tests and evaluations to find out how and why they work, especially the European companies; the French in particular are way ahead (FNN staff 2006). Some base enzymes that are produced at farm level are proteases in the form of bromelase from pineapples (Ananas comosus) and papain from papaya (Carica papaya). Bromelain is really a collection of similar protease, which are good protein digesting enzymes. Papain is also good at breaking down fibrous substances. Enzymes are also becoming popular in cosmetics as active ingredients. In face scrubs, the enzymes have the properties of assisting in the removal of dried and dead skin. In mouthwashes, enzymes help breakdown food substances and maybe assist in teeth whitening. In shampoos, enzymes perform the same process as in the face scrub for dandruff removal. In dishwashing detergents and all purpose cleaners, enzymes assist detergency in removing protein, greases and other organic substances. Some enzymes are noted to have preservative qualities in their own right, lessening the reliance on preservatives like parabens. The beauty in these products are in their simplicity and naturalness, which makes them popular with consumers who appreciate them for their basic efficacy and ‘greenness’. The word essential oil is often used as an umbrella term to cover a number of different natural volatile aromatic materials, although strictly speaking not all of these materials are essential oils. Natural aromatic materials can be extracted from the roots, rhizomes, wood, bark, leaves, stems, fruits, flowers and seeds, from a wide variety of plant, shrub and tree species. Different parts of the same plant may contain compounds which differ in their chemical composition, and may or may not require different methods to extract these compounds effectively. Primarily, the extraction method used determines whether the aromatic extract is called an essential oil, concrete, absolute, tincture, pomade, oleoresin, or balsam. The World farm-gate value of essential oils is approximately USD 2 Billion per annum, of which almost half are used for the production of flavour and fragrance compounds used in cosmetics, personal care products, household cleaners, and processed foods, etc. Essential oils are also used in cosmetics, aromatherapy, as industrial intermediates to produce other compounds, pharmaceuticals and agricultural pesticides and fungicides. It is in this area that the use of essential oils is growing exponentially. A new generation of crop protection products is emerging in the market, based on soap and essential oil emulsions. These products take advantage of the anti-microbial properties of tea tree oil (Melaleuca alternifolia) to function as a fungicide. Biomor of the United States manufactures these products under the trademarks of Timor and Timorex. These products are certified as fully organic and are sold as fungicides and insecticides. The company claims that these products can be tailor made to selectively attack insects, leaving those beneficial alone. It is further claimed that these products leave no residual and can fully negate the need to use copper or sulphur in field application. The following photo shows the efficacy of the product on cucumber leaves, compared to a control and commercially available synthetic products. Plant extracts in some form or another due to both scientific and market reasons are leading to pronounced aspirations on the part of consumers to use more in the future. Thus this opportunity involves both the sourcing of new potential plant extracts and the determination of the viability to produce existing herbal extracts of trade. From the market point of view, many more options exist to develop specialized value chains that can meet the requirements of specific sets of consumers. The development of new plant extracts generally involves the identification of active molecules and their associated mechanisms of action, requiring expensive studies to demonstrate efficacy and absence of toxicity. The production of existing plant extracts involves the setting up of a supply/value chain concerned with the production of plant biomass at the beginning, harvesting and processing of the crude materials, the processing of an extract and standardization, the development of a consumer product in some cases, and finally its distribution to consumers. This requires making the correct choices in order that these activities become are viable, and consequently there must be some quick method of investigation and evaluation – a current weakness in the Malaysian biotechnology/natural product development paradigm to date. This is important as failure discourages future attempts and creates negativity about a potential new agro-based activity. The ‘upstream’ usage of many products is most often ignored or left to hearsay and unsubstantiated information ultimately leads to failure. This is an unfortunate story told over and over again in Malaysia. There are three important areas that will determine the viability of any natural product. First are the actual characteristics and the nature of the product itself. Second is the agronomic viability of the crop in local conditions, and third includes the specific project issues. The next section will outline each area and briefly describe the important points to consider when making a determination about new material or product viability. The novelty of the essential oil is determined by the perceptions of the intended industry, i.e., onganoleptic or olfactory profiles for flavour and fragrances, folklore and fact for aromatherapy, or efficacy for cosmetic or agricultural applications. The degree of novelty is limited by the closeness of substitutes. The potential uses and applications of the new essential oil. These have to be accepted by those within respective industries. The closeness of any substitutes. The closer any potential substitutes the less the potential. The stability of the new essential oil. The essential oil must be stable in potential applications. The cost/performance ratio. The new essential oil must perform cost effectively in potential applications to be of interest to industry. Toxicity is a major issue in the international trade of essential oils, particularly to the EU markets. This may take a lot of time and expense to develop a dossier to prove product safety. The general consistency of quality and supply. Any new essential oil must have enough production volume for major potential customers to take the product seriously. The prevailing market/product trends. New essential oils that match current market trends will be more acceptable than those that don’t. The current level of technology. The more difficult it is to reconstitute a new essential oil in a laboratory, the greater the market potential (Hunter 2009, pp. 245-246). 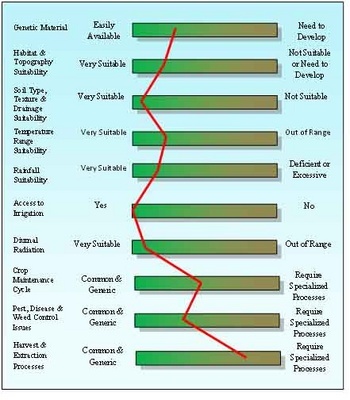 Figure 3 shows a grid with each of the above product characteristics plotted vertically where a determination about each characteristic can be made and plotted. Line A shows an essential oil with low novelty, and low potential applications, etc. This would not be very viable. In contrast line B is highly novel and high potential applications, etc., and is highly viable. 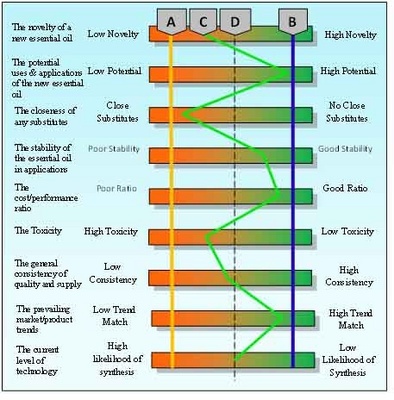 However most new essential oils will not have uniform viability across all the characteristics like line C and require great examination about what characteristics are most important to the potential market sector. Line D shows a new essential oil that has very little advantages and thus of marginal industry value. Figure 3. A Grid showing the characteristics of a new essential oil. The second area of evaluation is straight forward agronomic evaluation. These include the availability of the correct genetic material, the habitat and topography of the selected land site, soil type, texture and drainage, temperature range suitability, rainfall suitability, access to irrigation, diurnal radiation, the complexity of the crop maintenance cycle, pest, disease and weed issues, and the complexity of harvest and extraction. Very few crops have exact matches with the land they are planted upon, but the grid shown in figure 4 lays out the issues visually so the required conditions for the new essential oil can be evaluated according to the proposed land site. The final area of evaluation is primarily specific project issues that will vary according to the entrepreneur, enterprise, and location. 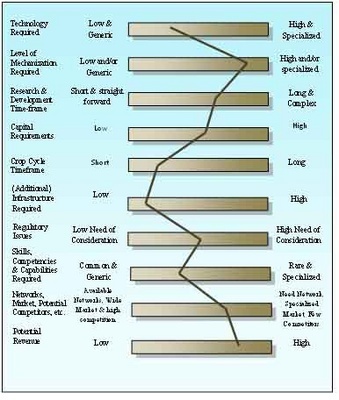 Is the technology required for the venture low and generic or high and specialized? Different entrepreneurs will have different access to technologies and thus make different evaluations. Likewise the level of mechanization will depend both upon the type of crop and planned farm size. Different crops will have different research time frames ranging from simple trials to long drawn out formal research projects in conjunction with outside research institutions. Capital requirements will be unique to the type of crop, and depend partly on existing farm infrastructure to some degree. It will be much more costly for an entrepreneur to enter the industry as a new player than expand production from an existing base. Crop cycle timeframes will vary according to the specific crop and different entrepreneurs have different views about what they are looking for and prefer. How much additional infrastructure is needed is a prime determinant of viability and will differ greatly among farmers. The last three criteria are extremely important. Regulation of essential oils has become so stringent of late. It is very important to spend a lot of time examining what is required in this area thoroughly. It is not just about meeting the cosmetic, pharmaceutical, or food law requirements here at home and abroad, but also about GAP, OSHA, and EPA, etc. The current level of skills, competencies, and capabilities is paramount to viability and success (see table 3). In most cases specific skills for specialized essential oils will be low, although basic agronomy knowledge may be good. The critical issue here is whether you believe and are prepared to travel along the steep learning curve needed to develop a new essential oil crop. Is this a challenge you want to accept, or something that makes you put the whole idea in the ‘too hard basket’? Finally, do you have the networking necessary to develop and market the crop? Where and what is the actual market you are planning to enter? How big is this potential market? And, Are there competitors or potential competitors around? Figure 5 shows the specific project criteria that need to be evaluated for viability. This short sojourn into examining new essential oil viability covers the basic issues in a pictorial way that will quickly highlight the issues and challenges requiring much greater thought. Each new natural product and project is unique and consequently will have it’s own unique challenges. Figure 5. The Project Characteristics. Table 3. A Simple Competency Audit Example (Hunter 2009, P. 299). Most industries prefer plant extracts that have full documentation and a history of use known to consumers exists. This requires pharmacopoeia, scientific dossier, and scientific journal results that are accepted by regulatory authorities. To meet many of these requirements, the outsourcing of extraction and processing according to international standards is required. Therefore developing this basic infrastructure around strategic locations of the state is necessary. SMEs must then decide whether they will specialize in the production of the crude material or incorporate that material into a consumer or industrial product, and this is where the development of the supply/value chain must take on major consideration. Natural product development fits into the traditional discipline of new crops, a field of agriculture which looks at the potential introduction of new species or varieties being placed in new locations, with new technologies for producing a product, with a new market, or a combination of all these factors. Thus, for a new natural product production venture to be successful, the application of new breeding techniques, efficient production systems, development of new products and markets are all required. In the majority of cases, the knowledge to achieve all the above is strange and unknown to the new producer. On the sales side, new customers, whatever position they are in the supply chain, need to be satisfied in terms of product, price, quality and service level. This product must be produced competitively enough to cover propagation, growing, crop maintenance, harvesting, processing, marketing and administrative costs, as well as allowing for enough profit margin for each member in the value chain. Developing and managing a successful natural product venture requires understanding the technical disciplines of botany, natural product chemistry, plant physiology, propagation methods, agronomy, agricultural and extraction engineering, and analytical chemistry, as figure 6 depicts. Many technical problems require solutions that can be only partly solved through individual disciplines, thus requiring an interdisciplinary approach. In addition, farm to consumer supply chain knowledge, planning and market development is necessary. Both areas of knowledge and expertise must be developed in tandem to create a venture that is successful. Ignoring either side of the new venture development, will most likely lead to failure. In many cases, those setting out to develop a new natural based product venture will usually have little previous farming, processing and/or market experience. This immediately sets out a number of challenges. Firstly the degree of success will be directly related to what crop is chosen. Selecting the right crop to grow (and this also has much subjectivity), will depend upon the access to good information which can lead to the making of informed decisions. Usually the first exposure to knowledge is news passed on from a friend, conference or seminar or some form of media, electronic or otherwise. There is no shortage of media reports and internet information about natural products, which can lead to ideas. However one must be extremely cautious as most media reports, internet information and even many conference and seminar papers which are sometimes developed for publicity purposes and can be full of ‘hype‘ and enthusiasm, rather than factual information and knowledge. Technical and scientific papers although often of great use in technical development, however they are not marketing documents The potential producer needs to be aware of the limitations of published information. The above sources of information can lead to no shortage of ideas, which sometimes carry emotive wishes. These ideas must be filtered through the use of more factual information to screen the facts from the ‘hype‘. Decisions need to be made on the best factual information available, which can lead to accurate knowledge. This can only be achieved through discussions with potential customers and trial and error in field trials, so knowledge can be developed into the wisdom needed to develop a successful enterprise. Figure 7. shows the hierarchy of information that one has access to aid the essential oil development process. This process must eliminate wishful thinking and excitement to convert mindful enquiry into a more rational and objective frame to be able to observe the realities of technical and market issues, before proceeding to the next stage. Figure 7. 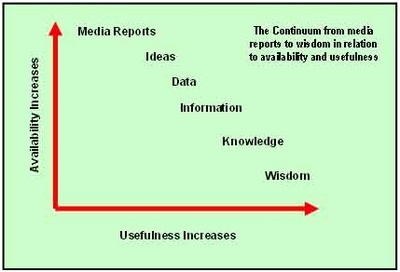 The continuum from media reports to wisdom in relation to availability and usefulness. Strategy development must also take into account the interest of the promoter and accommodate his or her vision. This interest may be generated from thoughts and feelings about the industry, products and markets, originating from a desire to vertically integrate into agricultural production, an interest in a specific natural, a wish to develop products from a specific or group of natural products or a desire to find an alternative crop. Whatever the inspiration for the promoter’s vision is, it will most likely fit into the natural product Strategic Matrix shown in Table 4. This matrix identifies the basic characteristics of the contemplated natural product as 1) an existing crop – product already traded, 2) an existing crop – leading to a new product, 3) a new crop to a new geographical area, where the product is already traded, and 4) a new crop and new product. Shown in the table below are the specific important issues (or desired outcomes) that will become important objectives of the development project. The promoter’s vision may involve a want to produce value added products based on the crude material as an input into a final product, or utilising parts of the plant material for the production of other by-products, or utilising waste materials as much as possible to improve revenues and sustainability. In these cases the venture may market various products to different industries (i.e., agro-products, alternative energy feed-stocks, animal feed, etc. ), or in the case of value added essential oil products, focus on higher parts of the supply chain. These visions heavily influence the whole focus, capital, technology and processing, management and market development requirements of the venture. These value added and by-product diversifications also affect revenue. 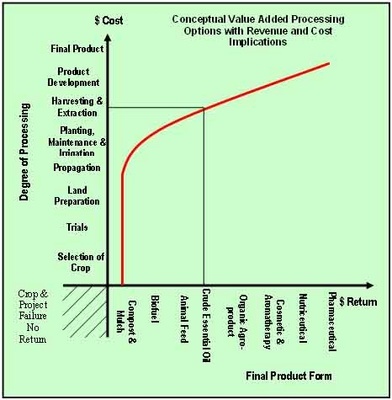 Figure 8. conceptually depicts the various value added processing options with cost and revenue implications. This can be seen as an improvement on existing production or setting up new production in an area already producing the crop. This may involve moving along the value chain to a new market based on an essential oil already produced or producing an essential oil for some type of value added product. This involves producing an essential oil already in trade in a new geographical area. This involves producing a product higher up the value chain, differentiating it and producing the natural product. After considering what type of product could be produced by the potential venture, which part of the supply chain will be focused upon to generate sales will be the next issue. The type of product and level of the supply chain the enterprise targets will require focus on different sets of issues. The production of an essential oil for the flavour and fragrance industry, especially an existing item of trade will require studies and information about current World demand and supply, future expectations, trends and the elasticity of supply from current producers. Once satisfied there is room for a new producer, the enterprise can target specific customers to work with or attempt to develop selling channels through traders on the open market. The development phase will be mostly concerned with technical aspects of producing the natural product, which include meeting regulatory requirements, producing the desired olfactory profile required by customers, and meeting a cost that provides a positive return to the producer. This enterprise has an agro-orientation, where the important issues are demand, supply, competitive costs and quality. Producing a new natural product will require focus upon potential specific industry applications that the oil will attempt to satisfy, whether it is for a flavour, fragrance or cosmetic ingredient, etc. Knowledge about final application of the oil in the intended industry use is important, so its potential value can be demonstrated. Some development of intellectual property, whether through patent or proprietary knowledge on process or product is likely, and can be used as a method to create barriers of entry to other potential producers. Within this focus, close work will most likely be undertaken with specific customers who may or may not exclusively purchase the product from the producer in the future. This type of enterprise has an industrial orientation, where the important issues are technical development, potential substitutes and complementary products. Producing one or a number of natural products as intermediate products in the production of end products, such as aromatherapy, cosmetic, agro-chemicals, nutraceuticals or pharmaceuticals requires a focus upon the market. This means understanding consumer tastes, trends, product development and how to engage consumer markets. The enterprise is required to develop products that match and fulfil consumer wants, building up a theme or corporate and product brand images that differentiate the product from others already in the market. The enterprise will be concerned with ways to make the message about their products reach as many consumers as possible within the groups they target. Over the last decade new methods like the internet and direct marketing channels in South-East Asia have become very popular and allowed a number of companies to utilise these alternative supply chains, as has been successfully undertaken by Thursday Plantation Tea Tree Oil in Northern New South Wales, Australia. This type of enterprise takes a consumer orientation, where emerging consumer trends, new product development and channels of distribution are their important issues. 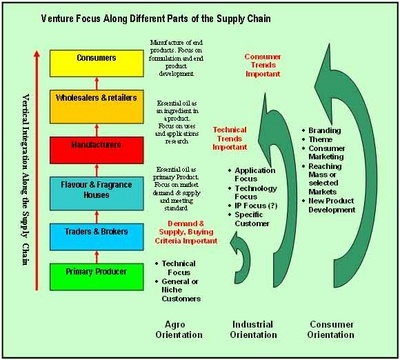 Figure 9. shows the various differences in venture focus along different parts of the supply chain. Figure 9. Venture Focus along Different Parts of the Supply Chain. The final consideration within the vision development for the potential project is the type of production structure, organisation and entry strategy. The structure and organisation will depend upon many factors. For example, issues like who are intended as the beneficiaries of the initiative, the selected crop, location, market size and potential market share target, required level of field and extraction technology and envisaged scale of the enterprise, will influence structure and oranisation. A number of options exist, which include a) wild collection, especially if the crop cannot be cultivated like sandalwood within a short to medium time frame, b) small scale production similar to a small holder if the project is a hobby, c) an extension crop of an existing farming enterprise, d) a small to medium sized plantation or e) a large plantation, if economies of scale are needed to develop the market based on cost competitiveness. These types of enterprises can be controlled and managed by an individual, family or company, a cooperative or community group, or a company controlling processing facilities and a marketing organisation. Lack of capital for production development. Difficulty in getting larger companies to commit, invest, and distribute products produced at village level. Solving the above problems requires a carefully thought out plan that takes into account the local conditions in Kelantan, involving a number of steps. Determine Kelantan’s Branding Advantages which involves developing a branding story and market philosophy that has horizontal and parallel diversification potential. This could be based on the development of the Toyyib/Halal herbal concept, organic, and ethically based community framework that will appeal to consumers outside of Kelantan and within the Asian region. For example herbal treatments based upon an Islamic theme would be able to exploit local biodiversity, utilize the local culture as part of the branding theme, maximize the benefit of location of “Brand Kelantan” as a marketing advantage which will create a new source of competitive advantage through differentiation into a relatively low competitive market segment. This branding exercise would reverse all the disadvantages of production fragmentation, remoteness and location into a strength – products produced by the community that benefit the community directly – the essence of Fairtrade and ethical products. Centralize the marketing and decentralize the production and ownership. Create an enterprise that centralizes the product development, marketing, sales, finance, and general operations and decentralizes the production to members of the alliance or cooperative. This marketing organization would be responsible for developing the business and responsible to the membership, who are the producers. The centralized enterprise would coordinate research with local research institutions, operate as a direct marketing company, promoting products through multiple channels like roadshows, airlines, airport terminals, shopping malls, and through online website shops. The firm would also possibly through a unit trust arrangement be able to raise capital from the public. The marketing company could be operated by graduates of University Malaysia Kelantan, under supervision of marketing professors – the younger generation working hand in hand with the older generation. Figure 10 depicts the business model described above. It must be strongly emphasized here that a small group of people will have to take the responsibility the potential crops, products, and value chains that need developing and take the initiative of educating and disseminating information among the kampong people, and in return receive a natural collaborative effort and participation from them. There is also the risk and tendency of duplicating and copying any successful product by others that may create a glut and oversupply of a particular product. 3. Direct and long-term trade relationships built on trust and mutual respect. 8. Professionals manning the PC, support the local community. Figure 10. 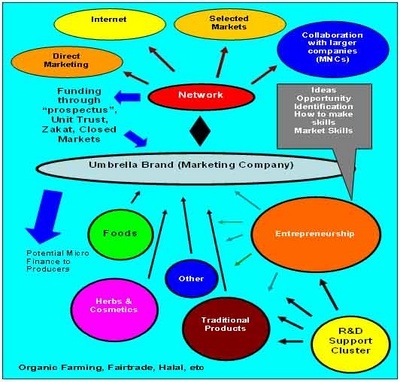 The “Brand Kelantan” Business Model (Modified from Hunter 2008). The cooperative would be committed to organic, integrated and sustainable production. The cooperative would be involved either in agriculture or in both agriculture and product manufacturing as part of the overall marketing strategy of the marketing company. Finance for the cooperative will come partly from the marketing company which will channel funds according to the cooperatives designated projects. The producing companies aim is to develop a share holding structure that is beneficial to all parties involved. It is hoped that key producers will become shareholders in the company, thereby becoming ‘producer partners’. Although PC will also engage in one-off trades with producers considered ‘non-partners’, the above benefits, and the option to become ‘shareholders’ and therefore receive a yearly ‘bonus’. A central marketing company could exist for each market. The objective of the central marketing company would be to develop and control the market in each country and organize producers according to the needs of the market. The company would primarily be involved in product development in association with a university, organizing logistics from producers to the market, providing finance to producer units and undertaking the national marketing. Access to local decentralized facilities. Remote regions in Kelantan like Jeli and Gua Musang will require common facilities that would be available to entrepreneurs in the area. Such facilities would drastically lower the barriers to entry into the natural product processing industry and solve issues like the requirement of GMP and HACCP compliance. Where a cluster of growers exist, common facilities will improve the viability of these enterprises. These are issues that the ECER authorities and Kelantan Biotechnology Corporation could consider. Most, if not all pieces of processing equipment can be locally fabricated. In fact, distillation equipment for farmers in Australia, Indonesia, India, and Cambodia, etc., are in the most part fabricated from scrap found and procured locally and built relatively cheaply with the right knowhow. Alternative methods of extraction such as solar distillation can be home-built very cheaply and suit small holders with small quantities of biomass to distil, eliminating all fuel costs at the same time. Small manual “Kubota” type farming equipment can be modified to assist with harvesting. Organic fertilizers can be produced within cooperatives where the “gotong royong” approach to production is taken, with each member taking home their share according to their efforts. Rapid advances in technology are driving economic growth and development throughout the world. Technology advances were the catalyst of the industrial revolution. The advances in information, communications, containerization and transport technologies over the last few decades have provided the means for businesses to operate on a global scale like never before. However, technology in much of the developing world is adopted without question. Dr. Asma warns there …“is also the tendency for Asian countries, including Malaysia, to deal with the issue of values in development by importing many technologies and systems wholesale from abroad without going through the process of mental transformation necessary to master them fully. Although Malaysia is going through rapid transformation, our growth is one without development in the context of knowledge contribution to science, engineering and technology. As long as we are consumers and operators of sophisticated techniques, plants and technologies imported wholesale from abroad, we are to a certain extent undergoing a technology-less form of industrialization. This transformation of values and attitudes is a key issue in the nation’s development agenda” (Asma 1995). Blind acceptance of technology is a barrier to empowerment, reinforcing the accepted market structure. Accepting technology as a given, is associated with a paradigm of doom, inhibiting local innovation. Processing factories with GMP status can be built within mobile shipping containers and be moved from region to region as needed for processing and manufacturing. Professor Howard Frederick of Deakin University pioneered this system building a chocolate factory in New Zealand which was transported to Melbourne Australia for production. The key to success is finding and developing appropriate technology for what is required. The role of local universities. Local universities will need to play a very important role as part of their outreach obligation to the community. This role would be wide and varied beginning in the field of local and situational research of potential new crops and rural industries for Kelantan. As mentioned earlier, Kelantan requires a localized rather than follow the national research agenda that organizations like MARDI are obligated to pursue. This may mean uncoupling research from the national agenda to focus on local needs and priorities. Therefore local universities need to fill the research gap that exists in Malaysia. Future essential oil research cannot rely on public research funding to assist in the establishment of new essential oils. Farmers will need to empower themselves and lead their own research in what is called farmer driven research (Biggs 1995). This research approach escapes the irrelevant research provided by public institutions and focuses on the real needs in developing a new crop (Martin & Sherington 1997). Many research models involve the farmer in their own crop trials, without the same rigour as academic research to achieve useable data that can be utilised by farming communities. 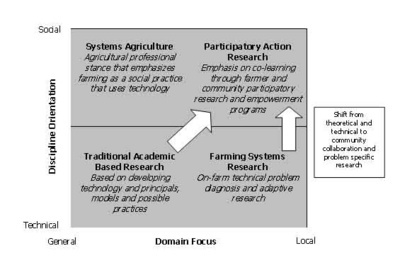 This approach is called participatory action research, farmer participatory research, participatory technology development and on-farm research. Although these models were originally developed for Third World farming communities, they are quickly being adapted to problems of farming in developed countries (Dillon & Virmani 1985). The shift from traditional based research to participatory action research is shown in Figure 11. The university will also need to play a role in providing specialized entrepreneurship programs for bio-entrepreneurship. These courses will be much more specialized than standard entrepreneurship courses provided to rural people through various agencies. Mentorship to members of the umbrella marketing company will also be important where marketing and entrepreneurship professors will need to advise and guide graduate executives of the company. There are few programs available to rural people at or near their domicile. Institutions set up specifically for community education most often lack instructors with business experience at the micro level. Those courses available are mostly based on conventional small business courses that are totally inadequate as they fail to empower participants in the creativity of ideas, and focus on business models, which already exist in heavy competition. They don’t show how to seek resources outside of traditional institutions and lack guidance in showing how to seek innovative ways to apply useful technology to the circumstances of how and where they live. The gap between what is available, and what is needed, can be seen when contrasting the various tenants of the small business and entrepreneurial paradigms as shown in Table 5. Risk is to be avoided by undertaking a business activity that is already proven to be successful. Therefore business models will not be novel. Ideas and opportunities are always risks. Every village and every person is unique and will have different ideas that suit them. A small business is totally orientated towards a financial return. Financial return may not be the prime motivator. Individuals and groups may want to produce something they like and have pride in. An enterprise will fit into a proven model so not much creativity is needed. The enterprise from the first idea may be driven by many types of creativity, and creativity itself may be a source of satisfaction. A small business is a business operated through a disciplined routine in most cases. Individuals and groups may be looking for maximum flexibility in an enterprise, so it can fit in with their life, rather than they have to fit in with the small business. Small businesses rely on little environmental change for success. Change in the environment may suit individuals and groups as they don’t want to get locked into routine, and change prototes their creativity. Financial independence is the objective. We are already independent and don’t want a business to lock us into a strict routine. A daily, weekly, monthly or seasonal cycle that is predictable. We may have to keep coming up with new things to keep the enterprise going. There are very tight resources to have much initiative. We rely on initiative to keep going, and all initiatives are considered. The future is controlled by sales in the marketplace. The future is in our hands of what we want to be. I want to be committed on my terms. I am the leader and do all tasks. Leadership is defined by tasks. Resource gathering needs revolution to enable empowerment. The current systems of finance available depend upon conventional business plans, collateral and experience. People have little knowledge of where to get grants and little ability to apply for them. Existing national grant schemes often make it so hard to get, many feel it is wasting time trying. So much government development money is going to development projects owned by the government, where it is hard to see how any people can benefit (Nor Baizura Basri 2007). Within Islamic communities large pools of funds exist through the Zakat mechanism which could be channeled for empowerment. “Zakat revenue can be spent under tamlik mechanism for providing an opportunity or raising productivity of the poor. Viewed from the long term perspective the poor would become in time self-reliant, hense reducing the national burden of spending money on social security schemes” (Khaliq Ahmad 2002). Likewise public structures like schools, mosques and community centres can be utilized for skills development and village meetings. Marketing channels and the existing financial system can be utilized through the unit trust mechanism to collect subscriptions from consumers to fund venture development in rural areas. This would be a direct link between consumers and producers, where the consumers themselves could also become stakeholders in village enterprises and share the same visions and dreams. Many consumers are looking for such a spiritual connection and products can become a facilitator of their aspirations and dreams, assisting them in how they want to see themselves, through spiritual materialism. This effort needs to be bottom-up rather than top-down with a community organization as the champion of the project. The track record of top-down initiatives is well documented and new approaches to rural development need to be experimented with. It is only when the rakyat feel that they own the project that it will be successful (Korten 1980). Finally this type of initiative should not forget who it is serving and be organized around the needs of the people it is intended to benefit. The author of the Millennium Goals Professor Jeffery Sachs also criticises the clinical approach taken to poverty eradication, stating many remedies imposed by agencies are more symbolic than substantive (Sachs 2005, P. 266). Sachs recognizes that development must start with the people themselves who must be ready and willing to act both individually and collaboratively, rejecting the acceptance of their fate (Sachs 2005, P. 242). However a bottom-up approach through a community based organization in Malaysia will be seen by many as not reachable, particularly with the author advocating new crops and targeting new markets, and new branding paradigms with new technologies to the people of Kelantan, in what some would think that this is beyond the comprehension of the kampong people. But just as we sit back and tend to start agreeing, we must remember the advances the OTOP program has made just a few kilometres North of here in Thailand. It is important to select a group of kampong people who really want to be involved in the early stages. The new paradigm of poverty eradication is through the principles of entrepreneurship where communities are empowered by enterprise. Such a concept outlined above has all the ingredients available to be successful. What is needed is just some “idea champions” to embrace the concepts and make it happen with institutional support. Team Kelantan is the true secret behind a successful Brand Kelantan as such a concept requires cooperation across a broad spectrum of communities and organizations. The state’s economic development becomes the responsibility of the people themselves. From the point of view of natural product development, government initiatives in the past have tended to have lacklustre successes, as these commercial activities must be in the hands of highly motivated entrepreneurs to be successful. National crop agendas may not be necessarily relevant to Kelantan in the same way they are relevant to other states, as the structure of agriculture is almost completely small holder based. Such a concept has a better chance of success in Kelantan due to the “special sense of identity” Kelantanese feel towards their land. Young graduates are the hope for future entrepreneurship in villages around the region, as the catalyst of change. They are tomorrow’s leaders and have a specific role to play in development. Students have access and knowledge to the information tools of our age. They are the potential mobilisers, liasers and leaders of village empowerment, should they choose to stay and do something. Graduates understand their own and also understand universities as a source of technology and can learn how to deal with relevant agencies for their cause. Graduates and the young are the only people who can build enterprises in rural areas in the future. Through linking all the elements together new organizations can be evolved that are based on the village model and link with consumers in developed markets in two way communication. Due to the advances in communication through the internet, graduates and villages now have unprecedented access to a wider international community of buyers, retailers, Fairtrade organisations and consumers directly, with which to communicate their intentions and seek support and customers; to advance the cause of empowerment to people in developed countries without third party agents. Asma, A., (1995). Going Glocal: Cultural Dimensions in Malaysian Management, Kuala Lumpur, Malaysian Institute of Management, P. 179. Developing Countries, 3-7 April, pp. 11-20. Dillon, J. L., and Virmani, S. M., (1985), The farming systems approach, in Muchow, R.
Brisbane, University of Queensland Press, pp. 507-532. FNN Staff, (2006), Innovators target cosmeceuticals niche, Functional Foods and Nutraceuticals, November, http://www.ffnmag.com/NH/ASP/strArticleID/1151/strSite/FFNSite/articleDisplay.asp (accessed 10th January 2007. Hunter, M. (2009). Essential Oils: Art, Science, Agriculture, Industry, & Entrepreneurship: A focus on the Asia-Pacific Region, New York, Nova Scientific. Hunter, M, (2011) Herbs, Plant Extratcts, and Essential Oils, ASEAN Agro Trade Business Review, 2011-2012. Ministry of Agriculture and Agro Based Industry, Putra Jaya, Malaysia, pp. 214-227. Kee, T. B., (1996), Monoculture in Malaysia: Impacts, Potential Solutions, paper presented to Monocultures: Environmental and Social Effects and Sustainable Alternatives Conference, Songkhla, Thailand, 2-6 June. Korten, D.C. (1980). Community Organization and Rural Development: A Learning process Approach, Public Administration Review, Vol. 40, No. 5, pp. 480-511. Ma’rof Redzuan & Fariborz Aref (2010). Path Analysis Model of the Development of handicraft Industries in Kelantan, Malaysia, Journal of American Science, 6(1), pp. 129-136. Martin, A., and Sherington, J., (1997), Participatory Research Methods-Implementation, Effectiveness and Institutional Context, Agricultural Systems, Vol. 55. No. 2, pp. 195-216. Nor Baizura Basri, Terinai Eyes Traditional Medicine Market in India, Bernama.com, 24th December 2007, http://www.bernama.com.my/bernama/v3/news_business.php?id=304142 (accessed 24th December 2007). Sachs, J. (2005). The End of Poverty: How we can make it happen in our lifetime, London, Penguin Books. Schumacher, E.F. (1975). Small is Beautiful: Economics as if people mattered, New York, Perennial Press. Report of an Ad Hoc Panel of the Board of Science and Technology for International Development, Neem; A Tree for Solving Global problems, Washington D.C., National Academy Press, 1992, P. 34. Shand, R.T. (1983). "The Role of Off-Farm Employment in the Development of Rural Asia: Issues", in R.T. Shand (ed. ), Off-Farm Employment in the Development of Rural Asia, Australian National University: National Centre for Development Studies. The Schumachian model of development could be considered to be based on the belief of a self-reliant economy that supports human development within their cultural paradigm, supported by appropriate rather than imported technology. In contrast, Rostow advocated the transformation of traditional society to becoming an industrialized society. Since the cost of importing machinery is often very high, R&D institutions need to focus on developing the ability to fabricate equipment locally that are suited to local conditions and cost a fraction of the price of importation. For example, the Northern Corridor Economic Region Initiative was launch last July in Northern Malaysia. It aims to engage private ‘Government linked Companies” (GLCs) to organize production of small holders in the Northern states of Malaysia. No studies have ever been undertaken to determine whether local farmers are willinging to except outside organizations controlling their lands in what are called ‘mini estates’. See Northern Corridor Economic Region Socioeconomic Blueprint 2007-2025, Sime Darby, Kuala Lumpur, 30th July 2007, P. 28. This is not beyond expectations as this has been successfully done in Thailand through the One Tambon One Product Program (OTOP) in the provinces of Narathiwat, Yala, Pettani, Satun, and Songkhla. New crops are referred to as crops for the future in the Malaysian 2012 budget speech. Partly modified from Kee, T. B., Monoculture in Malaysia: Impacts, Potential Solutions, paper presented to Monocultures: Environmental and Social Effects and Sustainable Alternatives Conference, Songkhla, Thailand, 2-6 June, 1996. The opening up of the potential to develop new value chains is partly the result of new market niches like organic, Halal, and ethical-Fairtrade, and the advent of the internet as a means of quick and simple communication across the globe. This includes Traditional Chinese Medicine (TCM), Ayurveda, Aromatherapy, Cosmetic and flavor and fragrance industries. European regulations prohibit or limit the use of a number of plants or ingredients in cosmetic products. The absence or reduced levels of potentially toxic products in herbal extracts must be determined. At a European level, products classified as CMR (carcinogenic, mutagenic and/or reprotoxic) as defined in Appendix VI of EC Directive N°1272/2008 concerning the classification, labelling and packaging of substances and mixtures, except if a waiver is granted. The presence of other constituents such as pyrrolizidine alkaloids, furanocoumarins or molecules known to be allergens or sensitising compounds, is not desired because of risks of possible toxicity or harmful adverse effects they could cause. The question related with the ecological status of vegetal resources and the social and environmental impact that could result from their harvest has to be addressed. Recommendations related to culture and collection of plant starting materials have received sustained interest for several years, especially for medicinal plants. The system implemented for plant-based medicines is a relatively precise regulatory framework defined by Directives or Recommendations from European and other international organisations such as the European Medicines Agency or the World Health Organization. These good culture and harvest practices are summarised in two documents: For Europe, by the “Guideline on Good Agricultural and Collection Practice” of the Committee on Herbal Medicinal Products of the European Medicines Agency (2006) Outside Europe, by the WHO Guidelines on Good Agricultural and Collection Practices (GACP) for medicinal plants (2003). In reality, these regulatory frameworks applied to medicinal plants can also be usefully employed for supplies of starting materials destined for non-medicinal uses. This is because the above-mentioned documents are partly based on preparation work conducted by the EUROPAM (European Herb Growers Association) that drafted an initial document entitled “Good Agricultural and Wild Collection Practice of Medicinal and Aromatic (Culinary) Plants” in 1998. This document included all plant starting materials and their derivatives, used and marketed in Europe, usually designated by the acronym MAP (Medicinal & Aromatic Plants). The general principles of these directives can be broken down into four major areas: identity, quality and hygiene, regulatory compliance and environmental responsibility. This to some degree follows the OTOP example in Thailand. In addition direct marketing in Malaysia and Asia generally has a high consumer penetration. Kelantanese products should have a special appeal through such a channel with a Toyyib/Halal ethical and community approach. Private communication with Encik Azaharuddin Hassanuddin of Institute of Development Studies (Sabah). Principals set out for peoples companies by Dr. Subash Mentha, Bangalore, India, as communicated to the author. Oils produced through solar distillation would also have a neutral carbon footprint if biomass was produced organically and possibly fetch premium prices in the world aromatherapy market. Private communication with Assistant Professor Pairat Watcharapun Prince of Songkla University, Hat Yai, Thailand. Sir, having had some experience with micro-agricultural-economic cultures meeting head-on with macro-industrial agricultural-economic cultures, I can find no fault with your Work or Assertions. Thank you for the Work you are doing for these Peoples and the Peoples of World at large, Dear Sir. Humankind can Benefit considerably from your brilliant observations and analyses. Nothing like Food for Thought and Thought for Food. The subtitle of this informative piece by Professor Hunter on development and entrepreneurship in a particular place in Asia contains three overt question words what, how and for whom. I suppose any treatise worthy of that name declares the what at the outset: what it is its subject matter, whom does it concern, and most importantly if it claims to be scientific how is what is being proposed to be achieved. In fact the more it claims to be scientific, the more references and footnotes are required. Of course there are other covert question words possible: where (geography), when (history), to whom, by whom which have to do less with technique and more with the vagaries of culture, that culture whose integrity is found desirable and rightly so, as per above piece. But there is a glaring omission in this scientific approach which is usually pointed out by those who live in that parallel universe of the humanities; and it is “why”? Which is to say, in the modern enlightened positivistic scientific approach to reality why remains the most neglected question word; the one that is either considered superfluous or frosting on the cake at best. Applying the why would imply that one delve seriously into questions such as: why is the Kelantanian culture, or any culture for that matter, be worth preserving and is positivistic capitalism actually capable of envisioning and doing it? Are they all equally valuable? Or this question: is there a purpose to any culture and if so is it transcendent or merely immanent, designed to make life more comfortable? Or this one: if the world is doomed and may come to an end in two weeks or so, or worse if the return is circular and eternal and determined, why the big fuss about cultures? Or this one: has culture been degraded to another market commodity? Those questions will usually be found laughable by those who live in that other parallel world of science which quantifies and measures utility and practicality and then markets the whole. So we are back to C.P. Snows’ The Two Worlds. One wonders if anybody in both universes are still reading and pondering such a book which supposedly was one of the 100 most influential books of the 20th century. One is led to wonder if it is by now considered passé given that we now live in the 21st century and what comes later must necessarily be superior to what came before. One also wonders if the enlightenment remains to enlighten itself. The basic questions of what, how, and for whom are the three basic economic questions any society must be concerned with. In this case “what” refers to what products can be produced at village level? “How” concerns the use of appropriate technologies for villages, and “for whom” is a market question. As to being scientific, this paper makes no claim. Instead it aims to make the whole development scenario as simple as possible through using very basic heuristical thoughts – in this case using checklists. It is done this way so communities can themselves work on this rather than “scientists” who come from outside. Prof. I have no divinity whatsoever so therefore consider that I do not have any wisdom or right for that matter to determine which culture is more appropriate than others. I must accept how others decide to live, unless it is interfering with others. It would be extremely arrogant for me to think any other way. I don’t want to be responsible for Margaret Mead turning over in her grave. However where we can assist is in helping communities develop the positive aspects of their culture and decrease the influence of the negative aspects of their culture in order to help them develop enterprises to enhance their personal sense of efficacy, social, spiritual, and financial wellbeing – please note the order hear. One guiding rule here Prof, and there aren’t many we can use comes from EF Schmacher of “Small is Beautiful” fame. We don’t take our ideas and methods and force them on the people, we must take the ideas and methods from the people and assist them reach the aspirations and potential they (not us) want to reach (paraphrased).Why the big fuss over cultures – that’s the paradigm the community lives within and as their guest we must accept their paradigm in their home. Prof mentions doom (Eleana’s article must have influenced you). This reminds me of what the Buddha once said (again paraphrased) – learn like there is a forever and live like there is no tomorrow. On books and philosophy, maybe its good to listen to what Einstein once said (paraphrased again). There comes a time when a man must stop reading other peoples’ ideas and think of his own. Community development is one such area where this advice may be sound. We have to learn as we go and keep check on our own sense of arrogance and continually check our inner motivations about what we do. Leah. Thank you for your words of encouragement. It means a lot as there are very few accolades in this vocation. All i can say in the words of Bobby Fuller, is that this area is so often a case of “I fought the law and the law won”. I agree with all the people you quoted, dear Professor Hunter; however the reason I have not given up reading books and pondering the ideas of others and encourage my students to do likewise is to mitigate the real danger that we reinvent the wheel and then delude ourselves that somehow we have come up with something original. This is especially true when it comes to philosophy, but as mentioned those who live in parallel universes may have a hard time recognizing that simple truth. However dont assume that anybody can ever know the truth. That could also be a delusion. What is the truth anyway? What is the truth today will be shown to be an untruth tomorrow. Truth is a work in progress rather than any absolute. Sometimes its good for an intellectual to get away from the coatails of others and actually express their own views. However many do not have the confidence of courage to do so. Im slowly learning that universities are actually anti-intelectual institutions, devoid of any real higher learning and wisdom. I also see this effect with religion. Religion seems to play on our deepest intinctic fears of humankind - death. religion to many offers the delusion of immortality, placating our limbic systems generartion of fear and anxiety. Sometimes I wonder will humanity ever develop its own intrinsic wisdom or is it dependent on some sort of philosophical or religious security blanket. Professor, I see where you are coming from. In philosophy it goes by the name of relativism. There was one such in Palestine who coming face to face with Truth itself asked: What is truth? His name was Pilate and he was a relativist too. One does what is appropriate to the situation and Kant deluded himself in postulating universal principles of ethics and this “loser” confronting Pilate must surely be a lunatic too since he went around saying blasphemies such as “I am the Truth and the Way” and “I and the Father are one” and “your sins are forgiven you.” He was indeed the king of a race of losers and the master race (the Romans) made sure that such a fact was proclaimed on the cross he was hung from. Funny though that such a lunatic vision and delusion is being celebrated by millions in two weeks. Which I suppose it means that half the world is delusional. Enter capitalism and entrepreneurship who will save us from delusions… Wait a minute, was it not called Marxism with religion as opium of the people? My oh my, does it get confused. I always think young people can get away with sarcasm much better than the very old. Indeed, the young also get away much better with intemperate and off the cuff statements. No wonder Aristotle opined that youth is wasted on the young; which doesn’t mean that it cannot also be wasted on the old, the very old and even the decrepit in body and mind, and that youth and old age may not be more a state of mind than anything else. Which would mean that Socrates was condemned for his old decrepit age of 70 and Aristotle was also exercising sarcasm as an old man would naturally do. One is led to wonder if it applied to Xantippe too. On the other hand if we read Aristotle’s Poetics reflectively we also arrive at the conclusion that a wise person, young or old, male or female remains able to discriminate between out-right ad hominem insults, telling the young or the old to shut up, sarcasm, irony and satire. The last two are to be found in some of the great literary and philosophical masterpieces ever written.